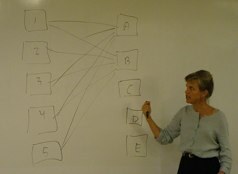 As a fellow in CIT’s Flexible Learning Spaces Fellowship (2008), Deb Reisinger participated in meetings, mini-workshops, and other fellowship activities centered around the concept of ‘flexible learning’ – specifically focused on the uses of the technology and space arrangements made possible by Duke’s new teaching and learning space, the Link. Students created wikis to house assignments over the course of the semester. The flexible learning spaces allowed students to work collaboratively on editing these assignments during class breakout sessions. The classroom space, combined with on-site technology check-out and support, allowed students to receive training in their classroom, rather than in a language lab. Using technology became more fluid and integrated into course pedagogy. Student presentations were enhanced by easier student access to technology (video, on-site computer), which is often stalled by technological difficulties. Reisinger used the learning spaces to show video and project images in addition to writing on the whiteboards. Students were able to use projectors to display follow-up to group work from multiple laptops. Multiple whiteboards made classroom learning more student-centered. Groups were better able to better demonstrate their analysis by mapping out and displaying their work on the whiteboards. Reisinger discovered that a large benefit of teaching in the Link came from the flexibility offered by the ability to bring technology in and out of the classroom as needs be.